It might not have the best of hardware numbers, but there is no area where it particularly disappoints. If you are looking for a sizeable phablet, and if your usage doesn’t involve pushing your phone to its extremes, This is for you. Samsung Galaxy C7 Pro is a good-looking device. It has Super AMOLED display with full-HD resolution and thin borders and the S Folder lets you lock private data. The phone is quick to focus and capture shots, and they come out sharp with accurate colours. Description: I bought this phone sometime back and I am in love with it. 64gb space and 4 gb ram are working just fine for my requirements. My previous experience with Samsung was not that good but this phone has actually changed my mind about this brand. Well done. 64gb internal space, 4 gb ram, 16 mega pixel camera with flash. No Samsung pay, nought update required. 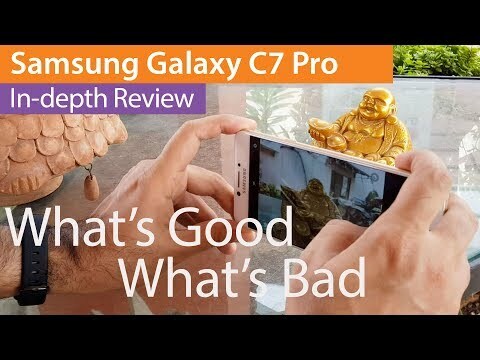 17 Pricebaba users have written their experience with Samsung Galaxy C7 Pro. If you own Samsung Galaxy C7 Pro, please do leave your feedback too. Lowest price of Samsung Galaxy C7 Pro price in India starts at Rs. 22,900 Samsung Galaxy C7 Pro is available on Flipkart at Rs. 26,600 and on Amazon at Rs. 22,900. Prices updated on 22nd April 2019. Samsung Galaxy C7 Pro is the company’s newest addition to its C-Series lineup that has been launched in India. The major attraction for the smartphone is its price tag and the efficient Snapdragon 626 processor. In terms of design language, the smartphone features a smart and elegant design that has smoothened edges for better grip. On the front, the Galaxy C7 Pro boasts of a 5.7-inch Full HD Super AMOLED display having a resolution of 1920 x 1080 pixels reproducing a crisp pixel density of about 386 PPI. For the shutterbugs, the Galaxy C7 Pro is equipped with a 16-megapixel primary camera and dual-tone LED flash, both of which are located on the rear-side of the smartphone. The handset is also capable of recording Full HD videos up to 1080 pixels @ 30fps. Up front, it features a 16-megapixel selfie camera having an aperture of f/1.9. The phone runs Android 6.0 Marshmallow out of the box. Under its hood, the Galaxy C7 Pro packs in an octa-core Snapdragon 626 processor clocking at 2.2 GHz. The smartphone also sports the Adreno 506 GPU with 4 GB RAM for an overall lag-free user interface. In terms of memory, the handset ships with 64 GB of onboard storage which can be expanded up to 256 GB through microSD card support. The C7 Pro is powered by a 3300mAh non-removable Li-ion battery coupled with fast charging support to top it up quickly. The smartphone also mounts a fingerprint scanner integrated into the physical home button. As far as connectivity is concerned, it supports all the standard norms such as 4G LTE, Wi-Fi, GPS, Bluetooth 4.2 and USB Type-C.
Ans: Yes, the Samsung Galaxy C7 Pro supports OTG. Ans: No, the Samsung Galaxy C7 Pro comes with a non-removable battery. Ans: Yes, the Samsung Galaxy C7 Pro supports Reliance Jio Network. Ans: It comes with Android 6.0 Marshmallow and hasn't received the Nougat update yet. Ans: Yes, it does feature a front-mounted fingerprint sensor. Ans: You’ll need a USB Type-C charging connector for this phone which will come inside the box itself.